All across the United States, Chick-fil-A fans flocked to their favorite restaurant, dressed in their beefy best, to receive free food as part of yesterday's Cow Appreciation Day. It's an annual event that the Duggars take part in each year. Last year, Jill and Derick Dillard joined in on the fun, but this year, Jana Duggar and Jessa Seewald headed up the family celebration at Chick-fil-A, with help from the Duggars' friend Laura. If you enjoy this blog, be sure to check out our other blogs (NashvilleWife.com and BatesFamilyBlog.com). Looks like Laura is the new Tabitha. I remember when Jessa said that many restaurants in their area changed their kids eat free policy after the Duggars ate there. I always thought it was awful that they took advantage of small privately owned businesses in that way, Jim Bob laughing at being so 'clever'. Times haven't really changed much, but at least this a a large chain where the impact to profit wouldn't be as great. Impact to profit Not so great? That's right, if the restaurant doesn't like it change it, put a 5 kid limit, one or 2 kids less than the Duggars (15 kids max).. There's not one thing wrong with going to a themed restaurant special, with 19 kids being thrifty is smart, not wily! Your comment is snarky because we can't take every instance and twist it to a Duggar Deposition. Jessa wasn't exaggerating either. I personally know of restaurants who did this in direct response to the Duggars abusing it. I never found it to be christianly to take advantage of businesses the way they do. I remember seeing that on the show years ago and being bothered by it. I didn't think it was a good Christian witness. 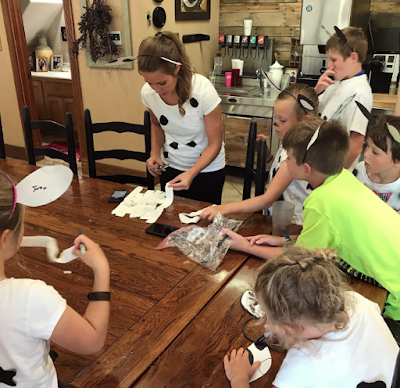 It's up to a restaurant to limit the number of kids who eat free, not necessarily up to a patron to voluntarily decide to limit the number of kids they bring, or whatever else you think the Duggars should have done. Yes, it is up to the restaurant, and that's why they changed it. It would be crazy to pay for something that someone is offering for free. I doubt at any time that they ever got 19 free meals. 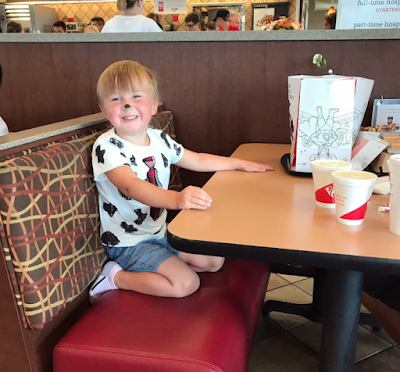 All restaurants have an age limit for free kids meals which is usually around ages 10-12. They would only have so many kids under that age at one time. I am sure they didn't go out to eat very often with that many kids, so I am sure they didn't put any restaurants out of business. Love these pictures! Henry looks adorable in his outfit. And Jessa seems like she is growing into a mature adult woman with her 2 children now. (I say this as a compliment). 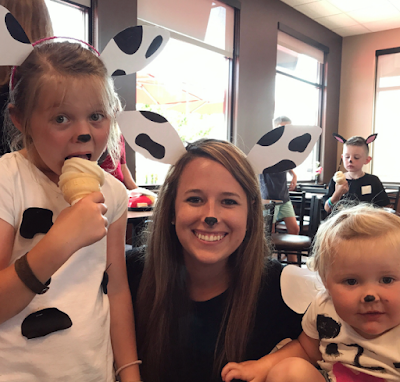 Every year I enjoy seeing lots of little ones and adults as well dress up as cows/calves for the Chick-Fil-A promotion. Costumes and everyone looks so cute!! This must be their substitute for Halloween. Is the top picture with Jana taken at home? I see a pop/soda fountain, I believe. That can't be healthy for kiddos. Once in awhile, but if they can help themselves all day, that could lead to serious issues especially if they start super young. Not trying to be mean. Just an observation. I hope they monitor the young ones if it is a soda fountain. That soda fountain has been there since the house was built. I've seen Duggar kids helping themselves to it, but usually when a crowd is there for dinner, since that's right across from the table. I've also seen jugs of store-bought lemonade and pre-sweetened tea stacked on that counter. And lots of plastic cups with names written on them. The soda fountain issue was addressed in a prior show. I can't remember all the details, but I think they said it is NOT stocked with soda. It's diet pop that's in the fountain. Pop won't harm kids that's just people making that up. It's just rumors. I drink diet pop and don't have 1 cavity. If you can see the labels clearly enough to see that it's "diet pop," then I can see them clearly enough to know that the green Sprite tap is regular Sprite, the red one is regular Coke, the brown one is regular A&W Root Beer, and the orange one is regular Sun-Kist or other orange soda. Diet versions of those are different colors. People do not "make up" that sugar from sodas is harmful empty calories. Nor is diet soda an improvement. Aside from the questionable chemical content, diet soda fools the taste buds into craving something sweet, leading to the consumption of other empty calories. I did a college paper on cyclamates and saccharin, back when those were used as artificial sweeteners in soda. I didn't "make it up." Michelle addressed that awhile ago, no soda only water. Oh the little ones are so cute and precious! The nearest Chick-fil-a is almost two hours away so we had to miss it. I forgot you can get ice cream cones there. Looks like they all had fun! 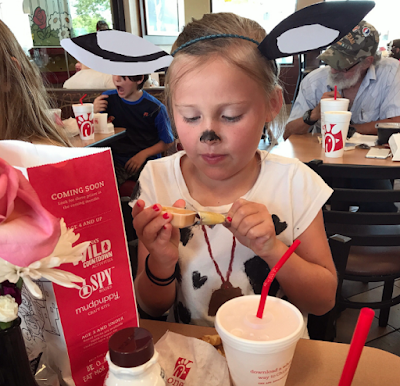 Oh now I'm wanting Chick-fil-a. Is Laura living at the "big house" with the Duggar family? Looks that way. Until there's clarification from someone, let the talk continue. No Laura doesn't live with them she is their cousin on their their moms side. I agree! Thanks for the positive comments! It seems like everyone is so judging of Jana's situation saying that she should do something else with her life or that her parents are making her feel bad so she'll help. Maybe she's just a sweet girl trying to be a blessing to her parents! I wish people would say that about her more often! Awww!! Love Henry's little costume!!! Yes, it's perfect for an October night of trick-or-treating. Not so perfect for a July afternoon in Arkansas, though. Good grief.. really? It was for a promotion. And even if it wasn't- did you ever dress up as a princess. That's probably not perfect for a July afternoon in Arkansas either, right?? There's a big difference between a little girl dressing up in a gauzy princess dress and putting a baby in a long-sleeved fleecy sleeper with socks on his hands. A little girl can say, "I'm hot!" and take the costume off. A baby can only swelter until someone notices that he's sweating or turning red or fussing. We hope he'd fuss...if he didn't, it would be a bad sign of overheating. Ladies, why don't you just come out and say it...Laura is the Duggar childrens' new tutor. She took over after Tabitha got married. Why doesn't this family have much honesty with their situations? Yes, what's up with Laura? Have they become her legal guardian, too? Or is she working for them? Not like we can't see that something's going on, with all the pictures they post. They have already said she is a friend of Jana's. But when you get information, because there's not dirt behind it, it isn't a good enough information. Who cares why Laura is there. There will share when they are ready- IF THERE IS ANYTING TO SHARE. How are they being dishonest? What does it matter if she is a tutor or not? The show is now about the older children. Michelle and Jim Bob are barely even shown. Should they come on the show to answer to you about every question you have? My son has a couple of friends who are over all the time. They don't live with us, but if you saw pictures, you might think they do. They enjoy being around each other. Laura may just like hanging out with Jana and the family or she may be working for them. She is an adult and doesn't have to answer to us. Laura us helping Michelle out with the tutoring. She probably diesn't mind being in the pictures. Why din't you get leave it along you are so noisy. Henry sure is getting big!! "Newlyweds who are leaving the size of their family up to God." This cliche' is getting old and is perpetuating a myth that people who use birth control are somehow less Christian or more Godly. I don't think so. Some people prefer a smaller family, some none at all. They should not be made to feel as though they somehow don't measure up. Also, children cannot choose their parents, but deserve no less than a loving and stable home. If you cannot provide that, the responsible thing to do is use contraception. We left our family size up to God. We ended up with three and I never regretted it. Totally agree, 12:42, and you put it so well. I've always wondered what would happen if any of these girls had a fertility problem. How would they work "leaving it up to God" into that situation? Wouldn't they feel (unnecessarily) as if God were punishing them for some reason? Why make things more complicated by saying that God is controlling your reproductive system in any way, good or bad? What about biology and medicine? And how do they explain atheists getting pregnant? If a mother wants a lot of kids, then she needs to be prepared to take care of them herself and not have to recruit lots of other people to help out because she has taken on more than she can handle by herself. Birth control is every couples personal choice. I don't think that the duggars are trying to make anyone feel guilty by any means, but they have the right to share what they are believe. I don't understand why everyone judges the diggers so harshly when they are such a great family just trying to please god and encourage others through the show. It's just not fair to them or their kids. Because we've seen many instances of hypocrisy, 10:17? And we don't think that's very becoming to the Christian image they want to sell? 1:51 every child is a gift from God, even those born to atheists, they just don't realize it. 11:14 AM TROLL.KEEP YOUR SNARKINESS OFF OF THIS PAGE. Perhaps the advent of reliable birth control has been a part of God's will. Certainly, one can argue that medical advances in general are part of His plan. Before family planning, many women died prematurely for the simple reason that their bodies wore out from childbearing. How we choose to use contraception or any medical technology is strictly up to us. Preventing pregnancy is not a sin. In fact, many times it is the right and responsible thing to do. Regina- That's great that not using contraception turned out to be right for you. It doesn't mean, however, that the same decision is right for everyone else or that God expects us all to do what you and the Duggars do. Having children should not be mandatory. Wouldn't you agree? Comment @ 5:52am 7/15/2017. Just because somone posts something you don't like does not mean you need to be so defensive and outright hostile. I appreciate the admin here try and post opinions from both sides, but sometimes they allow a post like this through which leaves me wondering what they are thinking, hardly fits in with a christian ethos! Does Jessa realize that her son is in a Halloween costume? not all costumes are strictly made for halloween, some are fun to just use to play dress-up. Yes genius, I'm sure she does. Do you have an every day cow costume you wear? A very HOT one, too! Just because a kid is wearing a costume, doesn't make it a Halloween costume. Good grief! If it's not used for Halloween, it becomes just a costume. And a pretty cute one on Henry. 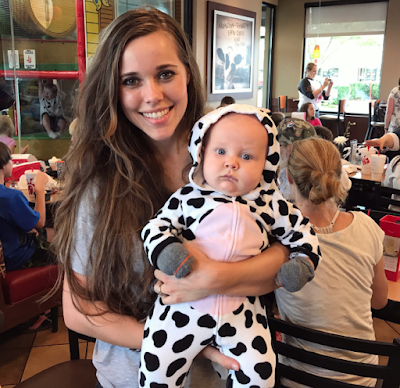 I thought the Duggars didn't believe in Halloween and didn't dress their children up in heathen costumes? Hmmm...who is Laura courting? John David? She's older than the single Duggars.